Burning Moon's Inside advice: Xehar Clothing Review! Finding cute clothing is always fun, sadly I can never usually find cute clothing in stores so I usually resort to buying clothing online since it is a lot easier to find clothing I actually like and want to wear. I recently found a website called Xehar that sells a wide range of clothing for curvy girls so I took a look through their clothing and found tons of clothing that are cute and functional. 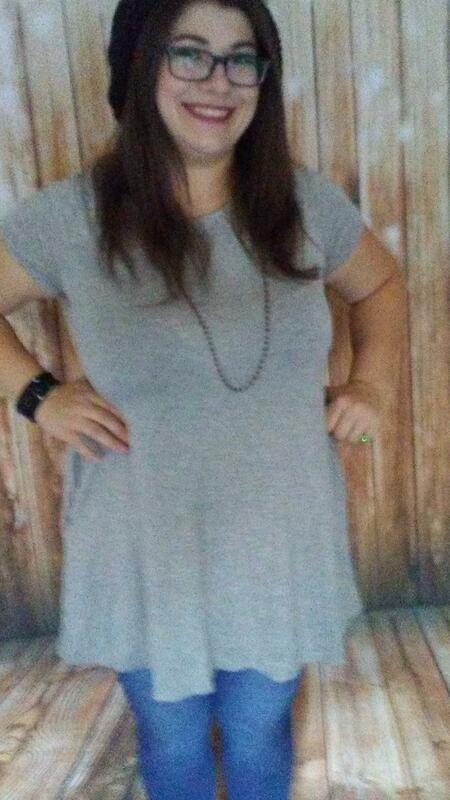 I wanted something I could wear for work that was comfortable so when I spotted the Payton Stylish Flowy Tunic (Retail $29.99) I thought it would make a good choice for work. I love the heather grey color it comes in and that fact that it has pockets, it is perfect for carrying your lipbalm, cash, etc. The shirt is made from 95% Rayon 5% Spandex so it is extremely comfortable and soft, my only problem is the shirt is a little too flowy for me. I have a large chest, and since this fabric isn't really extra flowy it just hangs straight down from the front of my chest instead of going in a bit so it looks a little like a tent on me I think I need a size smaller. My brothers girlfriend is pretty happy though because I passed the shirt onto her and not only does it fit her a lot better but she absolutely loves the shirt especially the pockets. One of the things I enjoy about their website is their shoe selection, there are so many fierce styles. My wife loves shirts with pockets too I will let her know about this site. I love this flowy tunic, and the color, too. It would be nice with jeans or leggings, too.